JOEL THURM directed DAVID SHUMAKER’s A Field of Poppies, 1965. LAWRENCE SACHAROW directed The Run to the Sea, RUTH KRAUSS’ 38 Haikus, The Cantilever Rainbow, and Newsletters, plus MICHAEL BENEDICT’s The Vaseline Photographer (1964-66). MICHAEL LOCASCIO wrote I’m in Love with W.S., 1962, directed RUTH YORCK’s Lullaby for a Dying Man, 1964. RON FABER appears in the earliest known Cino performance photo HERE. H.M. KOUTOUKAS and TAYLOR MEAD, the ones and onlys. BOB SHIELDS and DIANA MAE MUNCH were “Archie” and “Betty” in Archie and His Friends. DEBORAH LEE/LAWLOR, Producing Artistic Director, L.A.’s Fountain Theatre..
Left, KEITH CARSEY. Rght MILTON WYATT. Center, them in Crime in the Streets, a pirated play from TV which played the Cino in both 1961 and 1963. JOANNA MILES, appeared in LANFORD WILSON’s Home Free. An Emmy-winning actress and now a film producer. TED MORNEL and ANN SACHS, director and actress, The Warhol Machine, 1967. STEVE VAN VOST/DAVIS and half-brother PETER BROWN, 1995 (the latest picture PETER had of STEVE). BOB DAGNY (director of DAVID STARKWEATHER’s work, 1963). Read about Bob’s school HERE. GOLDIES JOKE #1: Me and Candy Darling, old before our time, playing great-grandparents at The Old Reliable Theatre Tavern, 1970. Candy was so free with his improvisations that I took advantage of my entrance being through the bar to down two quick Scotches before my entrance, to fortify me against his flights of imagination. Mad for adulation, I added (left) RICHARD SMITHIES and (right) WILLIAM M. HOFFMAN, HAAL BORSKE, PHOEBE WRAY, F. STORY TALBOT, JAMES D. GOSSAGE, WALTER HARRIS, H.M. KOUTOUKAS, LANFORD WILSON, and, seated, CLARIS NELSON! 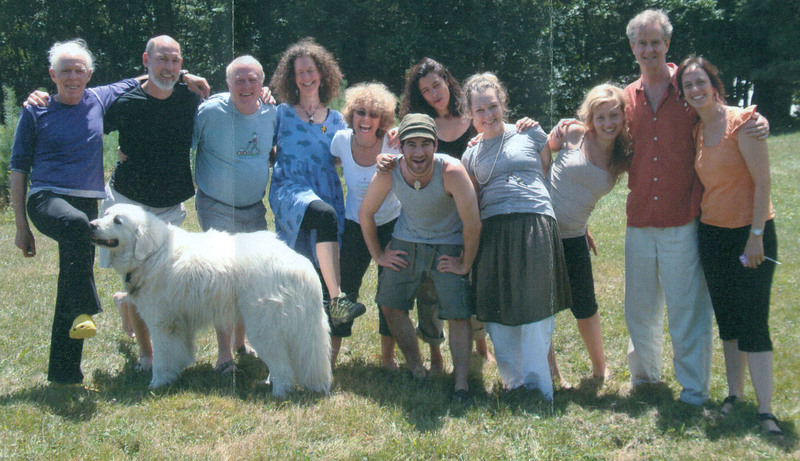 JEAN-CLAUDE VAN ITALIE (far left) with fellow-teachers and students at the Shantigar Foundation, Rowe, Massachusetts, where Buddhist Jean-Claude among other activities carries on the Off-Off Broadway workshop tradition and creates theatre pieces.